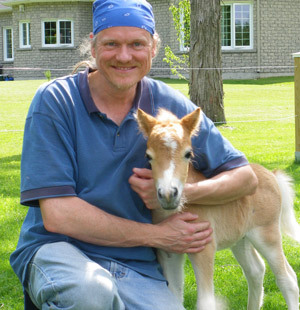 Is A Miniature Horse A Great Addition to Your Hobby Farm? 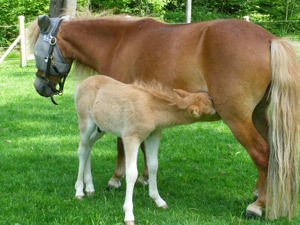 If you are researching miniature horse care because you would like a new pet, continue reading. Miniature horses are not only adorable, but most are also intelligent and easy to train. That is my friend Mike with Angel, a 5 day old newborn mini. He is 14 inches high and runs around like a madman. He already has a mind of his own and yesterday, instead of following him mom to the pasture, he ran full speed in the other direction. Miniature horses are on average no more than 38 inches high at the withers and live much longer than your average horse. On average about 25 - 35 years but many live into their 40's. The gentle personalities of the miniature horse as well as their cuteness factor make them the fastest growing equine breed in the world today. They are considered intelligent and easily trainable. If you are in search for a miniature horse for your hobby farm, take a look at the horse rescue organizations as well as horse auctions and save a mini from slaughter. When it comes to miniature horse care, A mini needs much the same care as a regular horse but in miniature. Handle a mini as you would a regular sized horse as minis can kick and bite.They are very cute but they can still land a punch. Teaching your miniature horse manners and obedience is a good idea. 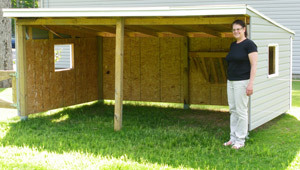 A miniature horse shelter is a scaled down horse shelter. Make sure the shelter opening faces away from wind. Move From Miniature Horse Care Back To How To Buy A Horse.